Sand Paloma available for Immediate Shipping. Stressless Buckingham Low-Back Loveseat- Enjoy Stress-free Delivery at Unwind. Feel the daily stress disappear when you order a Stressless Buckingham loveseat from The Unwind Company. Did you know that the Stressless Buckingham Low-Back Love Seat is available at a fantastic price in six beautiful Paloma Special Colors? The Paloma Leather Grade has quickly become the most popular leather to purchase the Buckingham Sofa in, due to its soft touch. The Six Paloma Special colors are as follows: Sand, Light Grey, Silver Grey, Sparrow Blue, Black, and Chocolate Paloma. To view any of these six colors or any of the other amazing leather of fabric types and colors available, simply use the pull down menu above, which is titled: "Select Leather of Fabric Type and Color". The price of the Stressless Buckingham Low-Back Love Seat will change based off of the leather or fabric type and color chosen. Looking for a leather of fabric type and color that is not on the pull down menu? Call 888-486-9463 to speak with an Ekornes Furniture Specialist. They will have access to all current promotions and will be able to find the perfect Stressless Furniture for any home! If you have questions or want to double check the latest pricing, please drop us a line at 888-486-9463. This Low-Back beauty is waiting for you. The lower back allows for a more casual appearance. This love seat is a perfect fit for almost any room. Day room, living room, television room. Many people prefer Stressless Loveseats in the low-back option because it allows a more continuous view of the room. The "Comfort Zones" on this model are identical to the larger and taller models. This means you can truly customize your furniture to your tastes and not sacrifice any level of comfort. This is just one more reason there aren't any competitors for Stressless. The entire Buckingham line of models is very popular. We occasionally are under-stocked. So don't wait, act now and save big on Paloma and Batick Leather special pricing options. If you hurry, there might even be a few in our clearance section. Click here to check: [Stressless Clearance]. The matching medium-sized seat is in the Windsor line of models. It is identical in every aspect except its height and width. Check out its page here: [Stressless Windsor Low Back Loveseat]. It is equally as comfortable and is available in all of the same colors. It is also backed by the same rock-solid 10 Year Warranty. Stressless by Ekornes is one of the most famous comfort furniture brands worldwide, and is manufactured in Norway. We serve customers the world over. You name a place and there is a person who knows about this furniture. Stressless loveseats have been manufactured for nearly 20 years and Ekornes is constantly working on improving every detail of the Ekornes loveseat and Stressless Furniture line. The matching Stressless recliners are: The Chelsea (S), Mayfair (M), & the Kensington (L). These chairs are guaranteed to make your back feel so supported and relaxed, you might think you are weightless or in a sea of tranquility. These matching recliners feature the same seaming and "Comfort Zone" design. They bring the highest levels of comfort and support to you and fall somewhere in the middle of the current Stressless pricing lineup. Once you sit down and let your body sink into the extremely soft cushioning, you'll know that you've reached a level of comfort you could previously only imagine. This family of recliners and loveseats is one of the most elegant models designed by Ekornes. Stressless loveseats relax your entire body through perfect balance and optimum support. 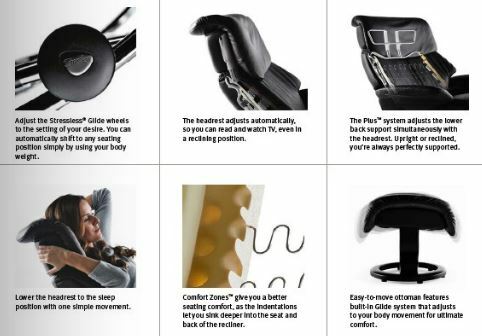 The Stressless® Glide wheels (located between the seats) allow you to customize the movement of your Stressless loveseat so that it is in sync with your body and your comfort. Comfort Zones™ are specifically shaped and molded to provide each seat with its own distinctive seating style and support. The indentations, seams, and shapes in these Comfort Zones allow your body to sink deeper into the seat, enhancing an individual user's level of comfort and overall satisfaction with their seat. During manufacturing, the technologically-advanced foam is applied directly onto the Stressless loveseat Frames. This allows for additional longevity for your seat cushions and your comfort. An additional pad of soft space-age foam ensures optimum comfort. The super-soft polyester fiber then cushions your body and ensures an attractive look. The sturdy stainless Steel Frame and the unique "Flexo Springs" allow your body to feel nearly weightless as you recline and relax. You can have ottomans that match both in style and upholstery. Add one of the many Small/Large loveseat Ottomans to your loveseat and you will be glad you did. Not only do these ottomans serve as hideaway storage, but they also have the capacity to tilt and adjust to your legs. This way, you get the best support for your legs- every time. Stressless loveseats are built to last a lifetime. Only the most premium leathers and fabrics are used to ensure a luxurious feel from Day 1 to Day 10,000. No one builds a loveseat like Stressless. Most customers want their furniture coordinated to enhance a particular style and feel of their home. In the past, this has been difficult to accomplish without the help of a seasoned interior designer or other professional. The Stressless furniture line by Ekornes offers collections in a number of matching styles, which allow you to arrange your living area to suit your style and needs. The design and coordination has already been taken care of. Stressless by Ekornes combines the very best comfort with perfect style to match any decor. We always have multiple Shipping options available! Including [Inside Residential or White Glove Delivery] We want your shopping experience with us to be truly "Stress-Free." Choose our White Glove delivery option if you would like your Stressless loveseat brought into your home, set up where you want it, and have our delivery teams take away all of the packaging. This is truly a frustration free experience. Choose PayPal Credit for their flexible payment options and familiarity. Finance your purchase of the beautiful Stressless Buckingham Low Back Love Seat, relax with flexible payment options and pay the balance off over time. Remove the pressure of shopping and truly relax and unwind. Easy Payments with PayPal Credit lets you get the comfortable Stressless Furniture when you want it, and budget your payments as you go. You can choose the monthly payment amount and the length of time that works best for you. After all, who know you better than you? Pay with peace of mind. PayPal will notify you when each monthly payment is due, so all that’s left to do is sit back, relax, and enjoy your purchase. Take the Comfort test at an Unwind location (or the Stressless store closest to you) and experience the difference a loveseat likes this makes. We will briefly discuss the "Comfort Test". 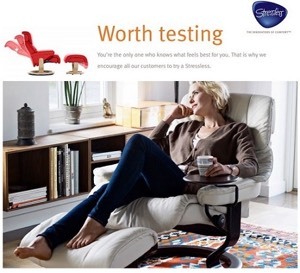 If you would like more information, give our Ekornes Experts a ring at 888-486-9463. It is a set of thought-provoking questions. We often times notice and think the answers to these questions. Stressless combined them into an easy "test" to allow you to be mindful as you are searching for the perfect seat and the solution to your aching back. Stressless loveseats are proudly carry an exclusive endorsment by the American Chiropractic Association (the ACA). Come visit an Unwind location to experience the Stressless Buckingham loveseat in person. If you have already decided and are ready to purchase, simply click the "Add To Shopping Bag" button above after selecting the available options. We offer many full-service delivery options. A stress-free shopping experience has been our #1 goal since 1997! We will ship your chair fully-assembled and fast in the United States (and most of North America). Please review our return policy prior to ordering or call 888-486-9463 for personal assistance. 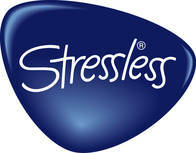 You may also email stressless@unwind.com anytime- 24 hours, 7 days a week. This model, as with Most Stressless loveseats, is available in a high-back and low-back version. This difference in heights allows you to pick which model and size you need. If you are looking for something taller then check out the [High-Backed Version]. Depending on the intended use, choose a high-back loveseat and a low-back loveseat, or vice versa, the choice is yours. We see many customers choose the high-back version for the family members that will be spending the most time in the loveseat or loveseat. The low-back versions work best for guests or kids that might not be tall enough to appreciate the extra head and neck support of a high-back loveseat. Regardless of which you prefer, all Stressless loveseats come with the benefits of individually adjusting seats and the patented Plus System and Stressless Glide System to soothe your body. Choose the perfect combination for any sized living room or meeting space. Need assistance in piecing together the perfect Stressless loveseat and loveseat combination? Drop us a line at 1-888-486-9463 to speak with an Ekornes expert. We also have multimedia experts that can help you in designing your home theater seating, utilizing Stressless sectional and theater components. Ekornes loveseats and Stressless Recliners offer four types of leather and a number of fabrics to choose from, in a multitude of colors. Want to learn more about the premium, top-grain leathers used by Ekornes? Click here: [Ekornes Leather Info]. The Stressless base is made from European beech wood, and comes in a range of different finishes. You can experience quite a few leather and wood combinations at the Unwind Video Library. A picture is worth a thousand words, and a video is even more valuable. It allows us to focus on the individual furniture pieces, "up-close and personal." While we find color charts handy, nothing replaces being able to see the actual leather, fabrics and wood stains as they appear on your Stressless recliner or Ekornes loveseat. Stressless Fabrics are another upholstery option. These fabrics manufactured by Ekornes are also of the highest caliber and come in a variety of colors. If you would like to learn more, scroll down or click here: [Fabric Information Page]. Maybe you would prefer one of the exquisite fabric upholsteries offered by Ekornes over the leather options. If this is the case, the options are nearly limitless. There are 6 different fabric grades and 64 different colors. 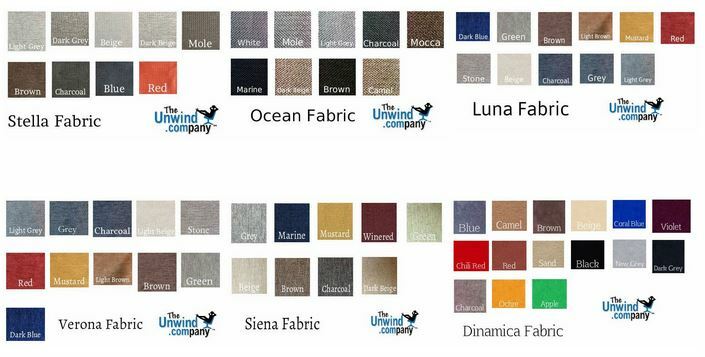 Your fabric options are: Stella, Ocean, Luna, Verona, Siena, and Dinamica. The Dinamica is the most exclusive and costs a little bit more than the other fabrics. It is usually equal in price to Batick Leather. Check out our color palettes to the left to see some of the available colors in each fabric. All Fabrics are available for Ekornes furniture. If you would like to learn more about each fabric individually, check out our Ekornes Fabric Page. Or call 888-486-9463 to speak with our knowledgeable Customer Support Team. They can give you a personalized description of each of these fabrics. Ekornes provides cleaning products for the fabric as well as leather upholstery options. Also, it's important to note that 5 of 6 of these fabrics are available at a lower price than the Leather options for Stressless and Ekornes Furniture. The Dinamica option is equal in pricing to the Batick Leather on most models. - Space-age injected cold-cured memory foam is molded directly over the steel frame, to cushion your back and body. This technique insures long-term foam performance and helps keep the frame and internal components secure. - Another layer of soft memory foam is added for additional cushioning and comfort. - Extremely soft Dacron fiber material cushions your body and insures an attractive look. - The patented Plus System provides continuous support for the head and lower back. The double-sided mechanism insures maximum stability and unmatched functionality. - Genuine top-grain leather covers the entire seat and ottoman (no shortcuts here, as is popular on many competing furniture products) for a luxurious look and feel and consistent aging (aah, like a fine wine, some things do get better with time). - Revolutionary Stressless Glide System allows you to automatically shift to any seating position by simply using your body weight. - Beautiful, hardened two-stem base on Stressless Recliners adds superior stability (not to mention great looks). Love my mayfair recliner and was finally ready to replace my loveseat. Added a stressless buckingham sofa and my living room is now amazing! Delivery was super fast and unwind customer service was a joy to deal with. Highly recommend this sofa and company.